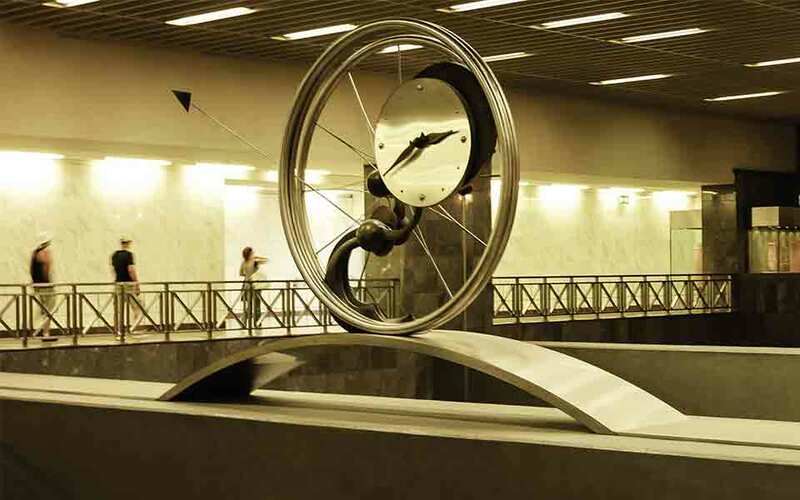 The sculpture “Metro Clock,” at the Syntagma metro station. Greek sculptor Theodoros Papadimitriou, who signed his work with his first name, died in Athens on Friday at the age of 87. Theodoros was born in the central Greek city of Agrinio in 1931 and studied at the Athens and Paris schools of fine art before going on to become a professor at the National Technical University of Athens (NTUA). His work has received numerous awards and distinctions, including the Rodin Prize, and the Grand Prix at the 42nd Contemporary Art Salon in Montrouge, Paris. A selection of work by the artist was also showcased at the documenta exhibition in Kassel, Germany, last year. A funeral service was held on Monday at the Church of Aghios Nikolaos Rigilis in Kolonaki at noon.